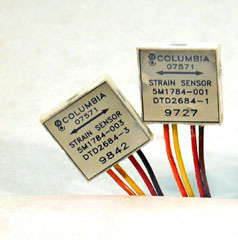 Columbia's Foil Strain Sensors measure the fatigue loading experienced by aircraft under various conditions of speed, weight and mission configuration more accurately than by older, less accurate counting accelerometer methods. These sensors allow critical undercarriage structures and surfaces to be more accurately monitored for potential fatigue damage induced by thousands of flight hours, high stress maneuvers and landings. The simplicity and reliability of these sensors also makes them suitable for routine use in the laboratory. These sensors are available in a choice of sensitive axis orientations. Models DTD2684-1, -2, -3, -4, -5 are flight-qualified sensors and have been the industry standard since their introduction in the early 1980's. Models DTD2684-11, -12, -13, -14 provide all the accuracy, ruggedness and ease of installation but with an alternate sensitive axis direction. Models are available to compensate materials commonly used in aircraft structural fabrication. Columbia Model 5802 Strain Gage Amplifier is designed to amplify the sensor signals providing both strain and temperature outputs.